The value of pipe #135 is 22 points. Chicagoland Pipe and Cigar Club held its annual Show April 23-25, 1999 and I was delighted to attend. 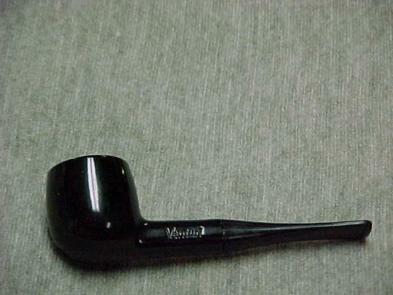 One of the dealers there, James Kesterson, had a few pyrolytic graphite pipes. I bought two; this is one of them. It has been the exemplar in my collection for several years. It only comes available now because I got an un-smoked example for the collection. This one has been smoked some, but the tobacco chamber has no cake build-up and the mouthpiece has only very light tooth-marks. The paint is very good too. I get to send this one to Japan for Rod Okamura! I am so glad he wanted it!